Said to ward off evil and bring good fortune to anyone keeping it in their gardens, sage was once a very popular herb in back yard gardens. Grown for it’s culinary and medicinal uses, sage originated in the Mediterranean before naturalizing in various regions around the world. Fortunately sage is an easy to grow herb, that is cold hardy and will come back year after year. With pretty little purple flowers on long stems, sage is a great way of attracting pollinators to your garden. 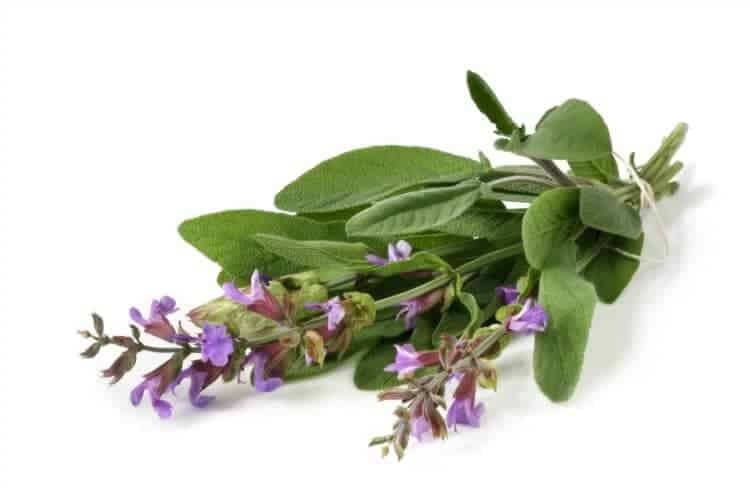 With soft, almost fuzzy, greyish-green tinged leaves, sage has a very potent flavor ideal for seasoning poultry, and bread stuffings, sage is one of the essential culinary herbs in European Cuisine, along with parsley, rosemary, and thyme. Grown as a hardy perennial herb in zones 5-8, sage will go dormant in the winter, and continue growing in spring. In warmer such as zones 9 – 11, sage is grown as an annual, as it does not particularly love hot humid weather. Common garden sage ( Salvia officinalis) is the most often used variety in the kitchen, but many other varieties do exit, and are often grown as ornamental plants. Purpurascens’ (‘Purpurea’), – a purple-leafed variety, and one with the most flavor next to the common garden variety. Sage is easily grown from seed, in both containers and traditional garden settings. A herb requiring almost no attention if located in full sun with well draining soil, sage is the ideal herb for beginner gardeners. To plant sage from seed, sow seeds indoors two weeks before the last frost in your area. Prepare a seed tray or small 5″ pot with well draining garden soil and compost, then water thoroughly. Remove any water that drains out the bottom. Plant the seeds 3 mm (1/8″) deep in the moist soil. Keep the soil moist until the seeds sprout, then move the seedlings to a sunny location. Thin seedlings to 24″ apart once they start to develop true leaves. You can also propagate sage with cuttings, or split large mature plants in the spring to help encourage new growth. Layering is another technique that can be used to grow sage. Simply bend a long, mature sage stem to the ground, and cover the middle of it with soil leaving about 4 to 5 inches of the “stem tip” exposed. The buried stem will start to grow roots in about a month, at which point the plant can be split from the host plant and moved to a new location. Sage does well planted as a companion plant for rosemary, cabbage, carrots, and other ‘hardy vegetables’ as it keeps away pests. Avoid planting with delicate vegetables such as cucumbers that are sensitive to aromatic herbs. As stated above, sage does not require a whole lot of attention if provided with medium to full sun, and a well draining location. It prefers sandy soils that are well draining with a fairly neutral ph of 6 or 7. Soil Test kits to test ph can be purchased online or at your local gardening supply store. In the first year, keep small sage plants well watered to prevent them from drying out. Cover and mulch well around the base of the plant to protect young herbs from hard winters. Older, well established sage plants may not need any winter protection at all. If growing sage in pots indoors, make sure they receive plenty of sunlight to remain healthy. Prune mature sage in spring, to control it’s shape and remove any dead or damaged stems. Removing large woody stems while the plant is still dormant, will help encourage new growth once the plant awakens. 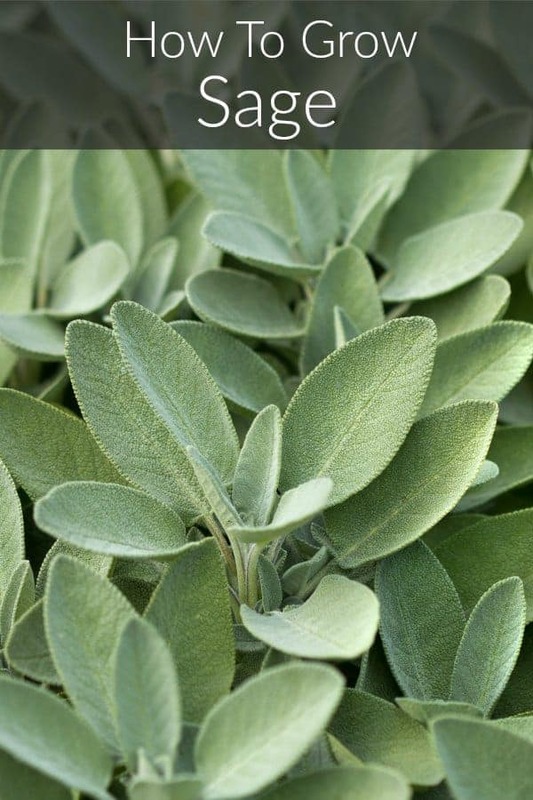 If using sage in the kitchen, trim/ harvest fresh sage as needed throughout the year. In late summer after sage sends up it’s flower stalks and blooms, trim back the flower heads, and harvest what sage you wish to preserve for winter. Never harvest more then 1/3 of the plant. If you feel your sage is struggling despite lots of sun and water, fertilize with a seaweed based fertilizer to help give it a boost. Resist the urge to over fertilize as it may create a larger plant, but at the expense of it’s flavor. Much like other hardy, and aromatic herbs, sage is of course best used when young and tender new leaves are available for harvest. In order to use sage year round though, you will need to preserve some of the leaves for winter use. 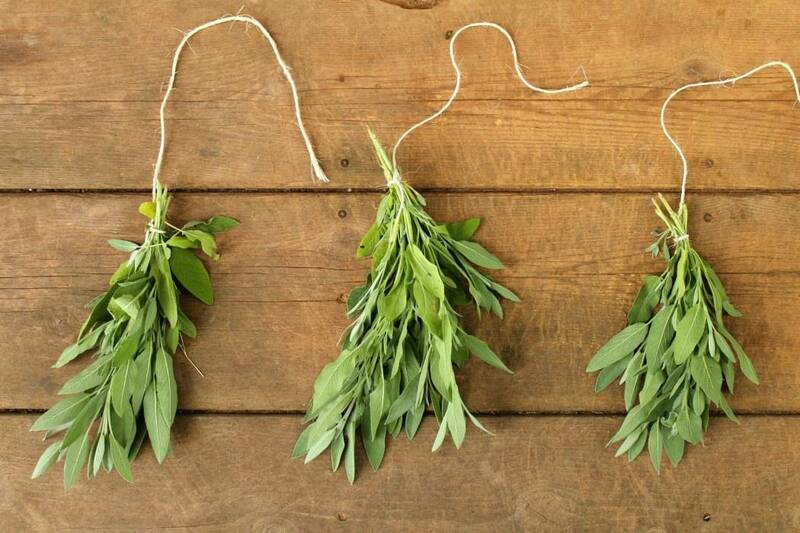 Sage is excellent for drying, and all that is required is to hang cut sage stems upside down in a cool dark location until the leaves are brittle and dry. Store the leaves in an airtight container such as a mason jar to preserve their freshness. 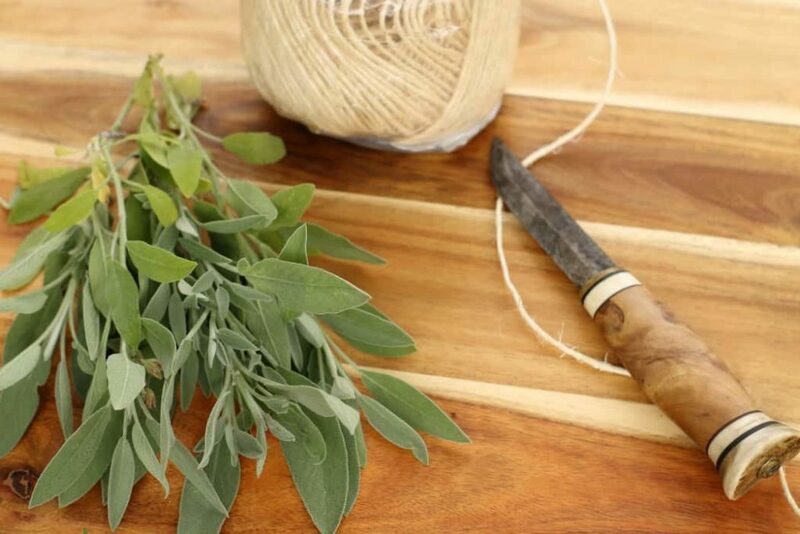 Dried sage leaves are perfect for making tea, using in dry rubs, and spice mixes. if you only want to preserve a little bit of sage, infusing sage into oil or vinegar is a great way of preserving this aromatic herb. Just as fresh rosemary and thyme can be infused into oil, so can sage. Simply wash, dry, and then pack a few springs of fresh sage in olive oil to infuse the oil with sage’s aromatic scent. Sage flowers can also be used for this purpose. Because sage is such a strong and aromatic herb, you don’t need a whole lot of it when using it in the kitchen. Use sparingly (you can always add more afterwards! ), especially when using dried sage. As a general rule of thumb, if a recipe calls for fresh herbs, use half as much dried herb in it’s place. With it’s distinct flavor, sage pairs very well with fatty meats such as, duck, pork, chicken, and beef. 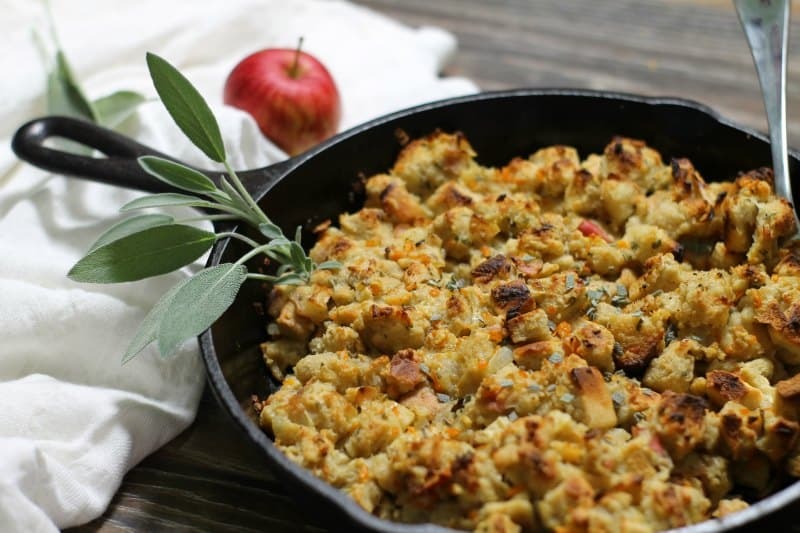 Try adding little fresh chopped sage to your pasta dishes, or adding it to your stuffing recipes, as in this apple & sage skillet stuffing. Interested In Growing More Herbs?